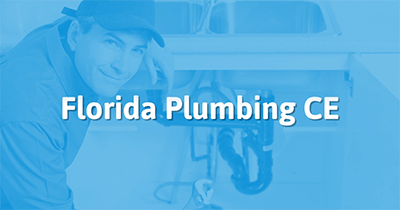 Take the continuing education to renew your FL Plumber's license today. All of our courses can be completed At Your Pace Online to help you meet the state's requirements to maintain your license. Once you finish your class you will have an official certificate of completion to save for your records, and we will report your course completion to the state for you. Registered Plumbing Contractors must renew by August 31st every odd-numbered year. Certified Plumbing Contractors must renew by August 31st of even-numbered years. The Florida Construction Industry Licensing Board requires contractors obtain 14 hours of continuing education every 2 years. The remaining 9hours are considered 'General' and can cover any of the listed topics above. This 7 hour course is specifically designed to meet the continuing education requirements for contractors whose license was issued more than one year but less than two years prior to August 31st. Topics covered in this course include Workers' Compensation, Building Codes, Regulation of Construction Contracting and more! "Continued course approval is subject to the course content being maintained in accordance with the materials submitted for evaluation Course materials should be modified to conform to changes in rules, statutes, codes and standards. You should submit significant modifications to course material to the department at least 90 days prior to those changes being incorporated into the course. The department or the board must approve such modifications before they may be incorporated into the course material,"
Also registered and certified contractors with the following license types: General, Building, Residential, Roofing, Specialty Structure or Glass and Glazing are required to have one hour of wind mitigation methodologies as part of their fourteen continuing education hours required for license renewal.